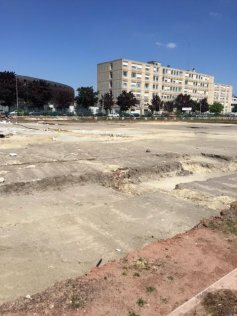 Archaeological excavations carried out over several years now in Seine-Saint-Denis have unearthed vestiges that testify to a very ancient occupation in the territory. In this small area, agricultural assets, climate and location were one and this encouraged populations to settle here since prehistoric times. This helped the region to develop remarkably since Gallic times. 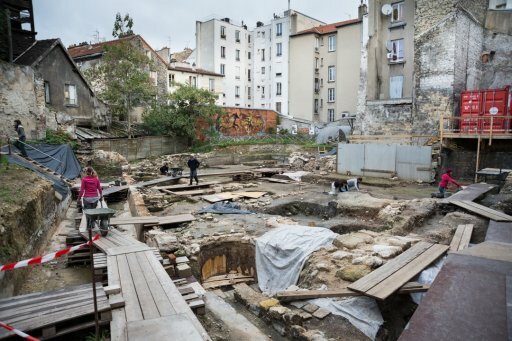 More than 400 archaeological sites have been identified in Seine-Saint-Denis. These sites have as many testimonies as epoques, from prehistoric times to the early nineteenth century. Two towns stand out within this archaeological heritage mainly due to their large number of sites and areas excavated: Tremblay-en-France and Saint-Denis. Tremblay-en-France is a testimony of its archaeological wealth with human occupation since the end of the Palaeolithic era. 20% of archaeological sites are to be found in this territory alone. Other towns conserve archaeological treasures underground. Among them, include the ancient antique populated village discovered at Gournay-sur-Marne, vestiges of Palaeolithic fauna found in the sand quarries of Montreuil in 1860, Neolithic sepulchres unearthed at Neuilly-sur-Marne, or the arms depot and adornment objects of the bronze age in Pantin. Two bifaces, exhumed respectively in Neuilly-sur-Marne and Noisy-le-Sec, which today constitute the most ancient traces of human presence on the territory. 300,000 years old, they are testimony to the presence of the most ancient human kind known in Europe, Homo erectus. The discovery of hunting tools from the Middle Paleolithic period, the Neanderthals (from about – 150,000 to – 30,000 years before our era, are testimony to a sporadic occupation in Clichy-sous-Bois, Saint-Ouen, Tremblay-en-France and Villepinte. The polished stones discovered in 1960 on the site of Bosquets Montfermeil indicate that they had a deep and solid mastery of working flint. With the Bronze Age, and then the first iron age (1800 to 500 before J.-C.), mastery of metalworking fundamentally altered the relationship between agricultural communities and their environment. Ruins and remains of habitation from the bronze and Iron Age of the so-called Hallstatt period are found in these cities; Gournay-sur-Marne and Saint-Denis, for both periods. One of the characteristics of the Bronze Age consisted of voluntary burials of used and broken objects. One of the depots, dating from 950 or 750 approximately, was discovered in Pantin. Moreover, many dredging operations of the Seine carried out in the second half of the nineteenth century delivered a number of tools and weapons. Confirmation of a Gallic civilisation in Seine-Saint-Denis initiated a historical cycle of 1500 years which generated a particular form of land planning of the territory, as revealed by the inhabitants of Bobigny and Saint-Ouen. Some isolated discoveries in Clichy-sous-Bois, Villepinte, Aulnay-sous-Bois, La Courneuve, but especially more important excavations in Saint-Ouen, Bobigny and Gournay-sur-Marne, are testimony to the remarkable densification of habitat from the fourth century BC. In Saint-Ouen, several silos dug into the ground suggest the presence of one of these isolated farms which then constituted the basic unit of space organization. However, in Bobigny, the presence of abundant high-quality archaeological furniture seems more accurately to indicate the existence of an aristocratic residence, or indeed a veritable agglomeration. The presence of a populated village was also probable in Gournay-sur-Marne. Finally, in Dugny, a vast enclosed area between 120 and 20 before BC., near the rivulet La Mollette, is testimony to a breeding tradition, which was to last in this place until the nineteenth century. In 1994, the mission carried out by the archaeological department spotted, while investigating a trench in Bobigny, close to the hospital Avicenne, a pit of important dimensions. After two excavation campaigns, a first observation stands out: the archaeological excavation site of Vache-à-l’aise corresponds to a Gallic habitat dating from 200 to the years 125 before J.C. This discovery allows one to believe that it was not impossible for this place to be occupied since the end of the third or the beginning of the second century BC. The "star" of excavations at the Vache-à-l’aise is an anthropomorphic oak sculpture) preserved length: 1,45 m, 2,32 recoverable). The conquest of Gaul by César between 58 and 50 BC, led to a profound reorganization of the area. During Roman times, the countryside in Seine-Saint-Denis, deeply humanised, was witness to a high density occupation which was not to be equalized until the twelfth century. 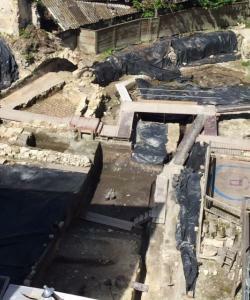 At Tremblay, thermal baths set up after 125 were discovered. Built inside a large villa, they contained several pieces of limestone and coloured coated sealing plaster. Swimming pools were heated from the ground and the walls. Sepulchres from the fourth century, unearthed in Drancy, are testimony to the evolution of funerary practices to the end of Antiquity: cremation gave way to burial. A bipartite sarcophagus contains, along with the body of the deceased, many potteries. Similar deposits were associated with other burials, left in simple wooden coffins, or sometimes directly in the ground. One of them delivered a goblet and a stamped cup imported from the Argonne workshop. The presence of a ford at Gournay-sur-Marne explains without doubt the establishment of an urban conurbation associated with a port. Almost all the remains and vestiges unearthed predate 100 AD. Where some of the ancient sites were occupied during the early Middle Ages (Tremblay, Bondy, Saint-Denis, Aulnay, Clichy), most of them were abandoned. The narrowing of the habitat however did not exclude development, and some are at the origin of the medieval village. On the occasion of excavations carried out around and inside Saint-Lucien church in La Courneuve, a dozen decorated Merovingian sarcophagus were exhumed. These plastered sepulchres (characteristic of Île-de-France) confirmed the existence of a Christian community here from the 7th century. In the north of the Departement, terroirs were rapidly associated with the heritage of Saint-Denis Abbey considered, in medieval times, the first land owner in Île-de-France. Its domains, village, dominated by cereal-growing and viticulture already served as operating systems models. The industrial revolution of the Middle Ages gave (almost) the land aspect as it is today, thanks to large land clearings from the 11th to the 13th centuries. The most fertile regions essentially supplied Paris. Forests, such as Bondy forest, provided firewood and lumber in abundance. The place is renowned also thanks to the town of Saint-Denis, famous for its basilica where most of the kings of France are inhumed since Dagobert. Saint-Denis, a medieval town, built around the prestigious Merovingian Abbey, also celebrated for its textile industry and Foire du Lendit which attracted, in June, the Parisian crowd and many foreign merchants such as Flemish drapers. You can learn more about being a modern Indiana Jones by trying the free archaelogy workshops to do with your children on Wednesday afternoons.